Description Rendered in black pigment at the center of this yellow clay plate is the severed head of the gorgon Medusa, a motif referred to as the gorgoneion, with her large staring eyes, grimacing mouth, thick protruding tongue, and six hissing snakes emerging from her hair. She is encircled by two registers of real and mythical animals that fill the plate to the outer edge of its rim. Among the animals–lions, panthers, goats, and owls, as well as sphinxes and sirens–the inner register contains a bridled horse and rider. The plate was restored from numerous large pieces and contains portions of fill in yellow clay. Corinth dominated the Mediterranean pottery industry from the second half of the seventh century BCE through the first half of the sixth century BCE. Corinthian ceramics were typically light yellow or white clay decorated with black, white, and red glazes. 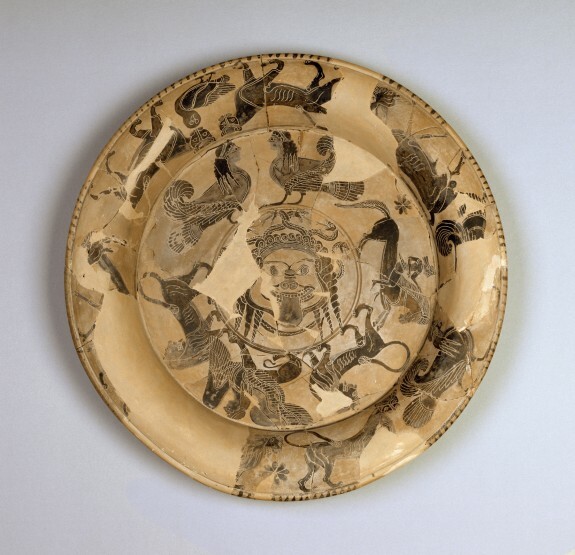 This style of pottery often uses Near Eastern, or “Orientalizing,” motifs, depicting real and mythological animals in registers crowded with incised rosettes. Imitating the style characteristic to the territory of Corinthian in the Orientalizing period, Athenian painters perfected their black-figure technique around 600 BCE. They replicated the typical Corinthian composition of concentric registers of real animals and mythical creatures, rendered with intricately incised details. The maker of this plate, called the Gorgon Painter by art historians, is one of the earliest recognized Attic black-figure vase painters. His name is derived from his painting on a dinos in the Musée du Louvre, on which he depicts Perseus with the Gorgons, Medusa and her sisters. The Centaur's Smile: The Human Animal in Early Greek Art. Princeton University Art Museum, Princeton. 2003-2004. Provenance Moise Emmanuelides, Athens [date and mode of acquisition unknown]; Joseph Brummer, New York and Paris, 1927, by purchase [inv. no. P4326]; Henry Walters, Baltimore, 1927, by purchase; Walters Art Museum, 1931, by bequest.